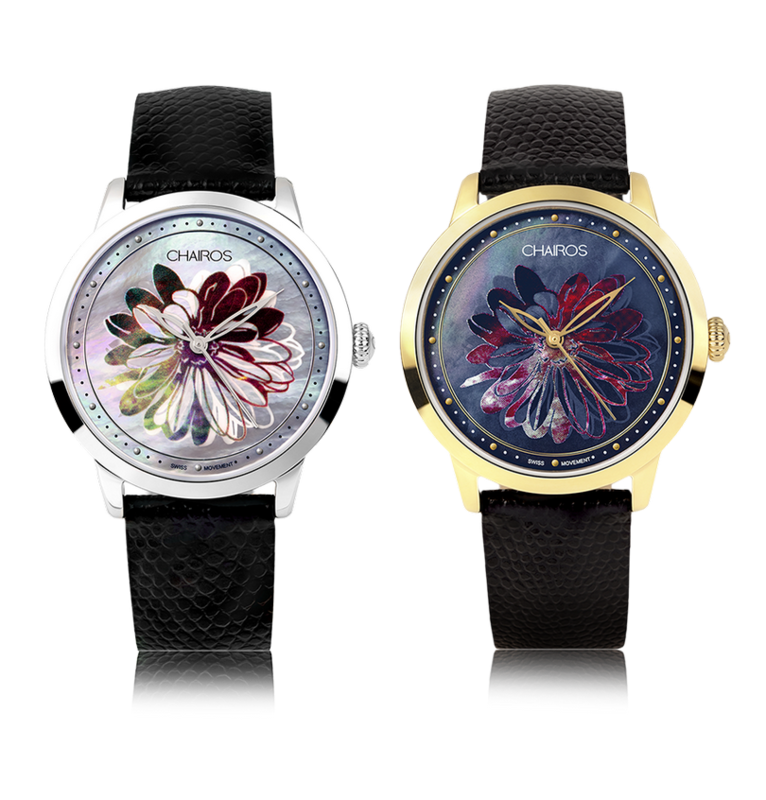 A watch filled with charm, CHAIROS Florette is the first ladies watch with a floral 3D printed dial. The floral design printed on the face exudes a burst of fresh fashion, while the slim leather band adds a classy finish. Florette’s amazing flat sapphire glass has a water resistance of up to 50 metres. This watch features a mother-of-pearl dial that runs on a Swiss-made movement. 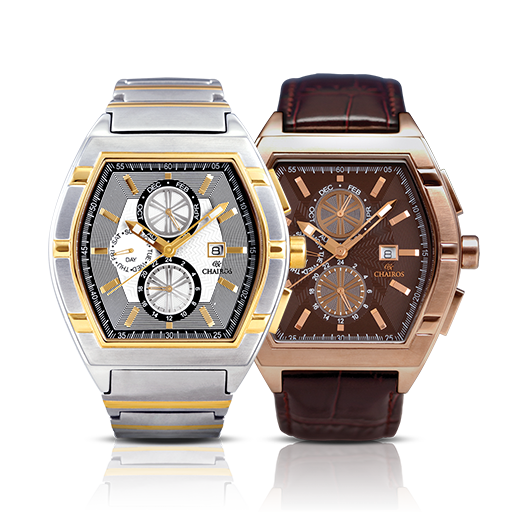 This elegant timepiece is available in two stylish designs, with gold plated and stainless-steel cases. 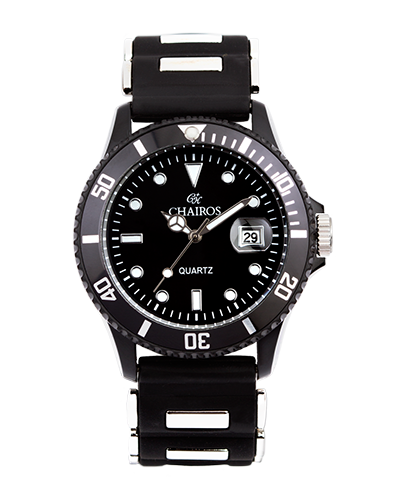 The Latitude by Chairos® is made for the man who works hard and plays harder. Its tough genuine leather strap and rich black stainless-steel case makes this timepiece suitable for formal occasions, while also being built to survive everyday use. This classy timepiece also comes with an appealing and durable stainless-steel dual-tone rose-gold-and-black-plated strap. Chairos® Latitude is both beautiful and functional, with a unique Retrograde pointer to indicate the day of the week, and an easy-to-read Big Date display on the dial. 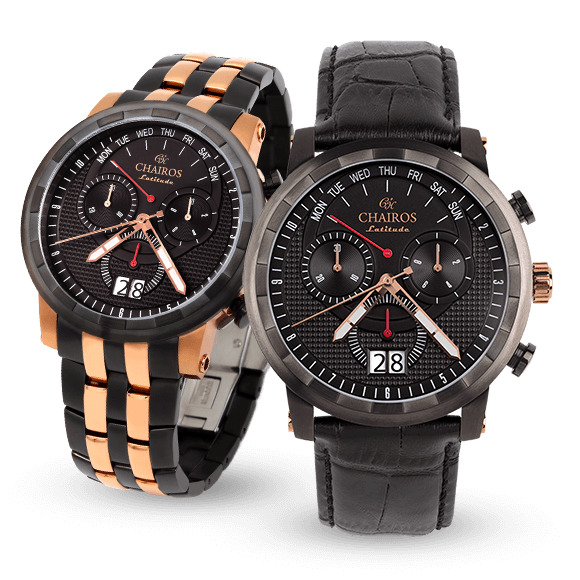 This watch is powered by Swiss quartz movement with chronograph function. 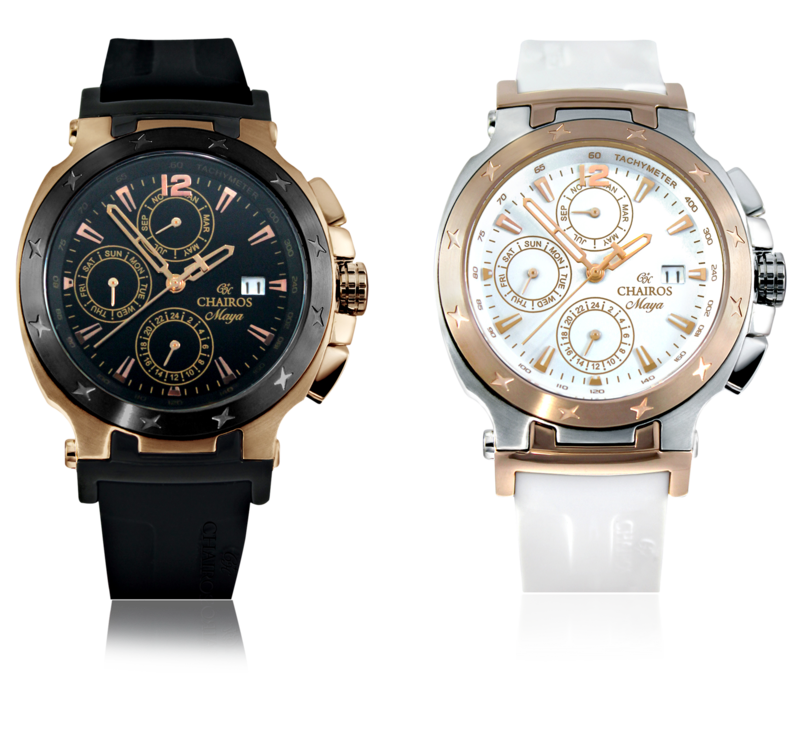 It provides a water resistance of up to 50 metres with the help of its durable and scratch-proof sapphire crystal glass. The Crusader by Chairos® is crafted for the ancient warrior in you. This watch is powered by an automatic Japanese movement, designed and assembled with discipline, precision, and superior craftsmanship. The rose gold-ridged bezel brings class, culture, and confidence into your everyday life. The durable, scratch-proof sapphire crystal glass gives it a water-resistant cover up to 50 metres. Adding a silver dial and bumping its case size up to 46 millimetres completes its overall appeal. The Crusader has a unique transparent back case that allows you to marvel at the inner workings of the watch. This functional and aesthetically pleasing timepiece comes with a nifty brown genuine soft leather strap and a classy stainless-steel dual-toned strap. For the spirited man that speeds through life, The Racer delivers a class of its own. With its sportive chronograph face resembling that of a race car dashboard, be prepared not only for the look but also for the feel. Where high-speed racing meets the precision of world-class Swiss movement; The Racer timepiece exudes fortitude and vigour, with a bold stainless steel red bezel and a tenacious stainless steel metal strap. Available in sleek black and white designs, enjoy Chairos® Racer for different occasions of the day, whilst celebrating the new dawn of the racing sport in India. Take your life onto the fast lane and release the inner racer within. 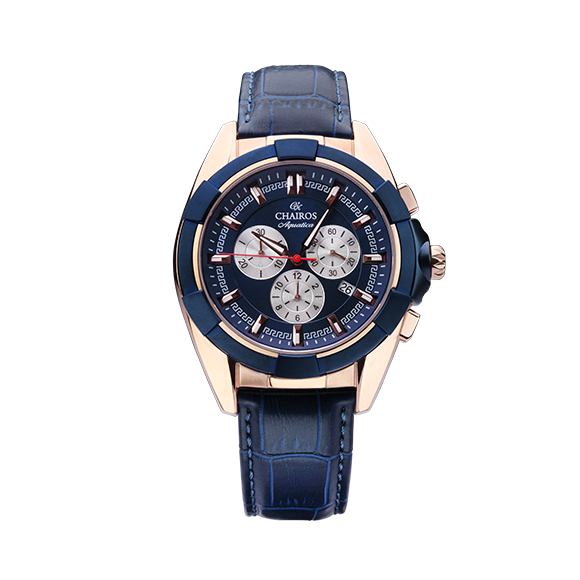 Inspired by the wondrous might of the ocean, Chairos® Aquatica grants you the power to track your active lifestyle, with a dual-tone blue and rose gold plated body, chronograph functionality, and a dial embellished with three unique contrasting eyes. The durable and scratch-proof sapphire crystal makes it water resistant to up to 50 meters. The sporty and smooth blue leather strap evokes an aquatic feel, making it a fantastic fashion statement that embraces precision and high-performance, suited for the on-the-go lifestyle. A Dazzling timepiece with black-grey dial enhances the beauty and grace of the modern women. 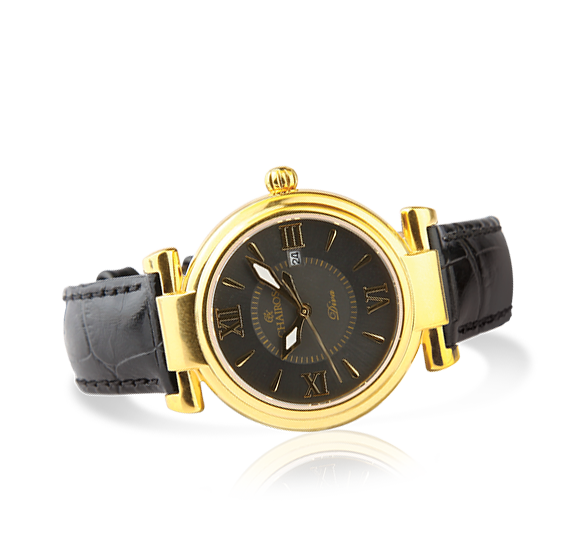 It has a stunning stainless steel case with IPG yellow gold plating and a premium quality genuine leather strap in black. Chairos® Diva comes with an additional set of genuine leather straps. The durable and scratch proof sapphire crystal glass gives it a water-resistant cover up to 50 metres. Adventure is your kryptonite; it beckons you like a moth to the flame. High in the mountains, under the seas, or a night out on the town, the Exagon watch is a worthy companion for all adventures. The mystery of the future is perfectly counterbalanced by the precision of now with the Exagon-the handsome new timepiece ideal for a man of action and sophistication. Available in Rose Gold and Steel. Athletic style, exquisite taste for an active woman’s lifestyle, calls for a watch that matches her strength, her grace and her aspirations. For the utmost in manufacturing excellence and effortless and sporty feminine charm, the Chairos® LaBelle says it all and is made available in four unique and enduring styles so that you can choose the perfect look for you. This is a tasteful symbol of your success, a sports-inspired luxury watch that makes a stunning fashion statement. Combining a precious piece of jewellery with the Swiss-movement functionality, the Chairos® Lynette sets the par for a whole new league of fashion accessory. With its classic but chic demeanour, every part of this exquisite timepiece has something for you. Flaunting a bezel encrusted in stunning Swarovski crystals, and a dial of deep blue, its beauty is accentuated by the modern touch of a black ceramic bracelet, adding to the grace of a woman with class. Made for special occasions, enjoy this practical but charming addition to your wardrobe. Making a style statement, Maya is crafted to amplify feminine charm. 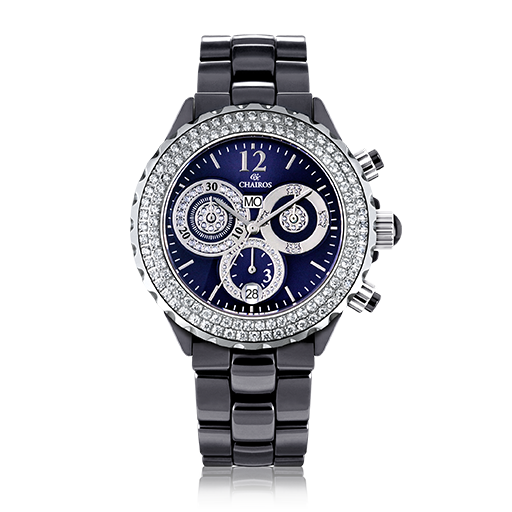 Maya is a multi-function watch and has a scratch resistant sapphire quoted glass. This timepiece has a water resistance of 165 ft. and is powered with Swiss quartz movement. The superior quality silicon rubber strap gives a soft and gentle feel on the wrist. 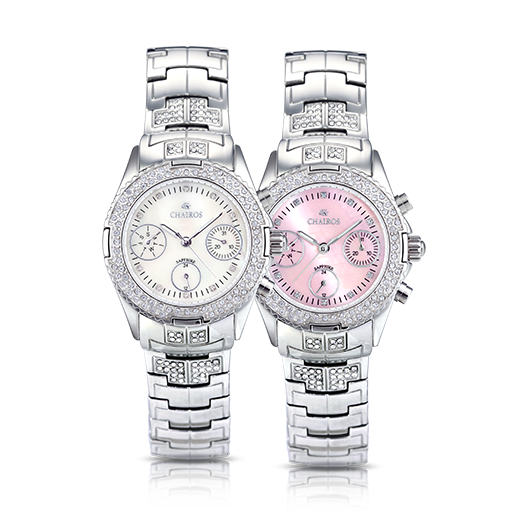 A dazzling watch for women, boasts a trendy circular white dial that elegantly sports the brand name. 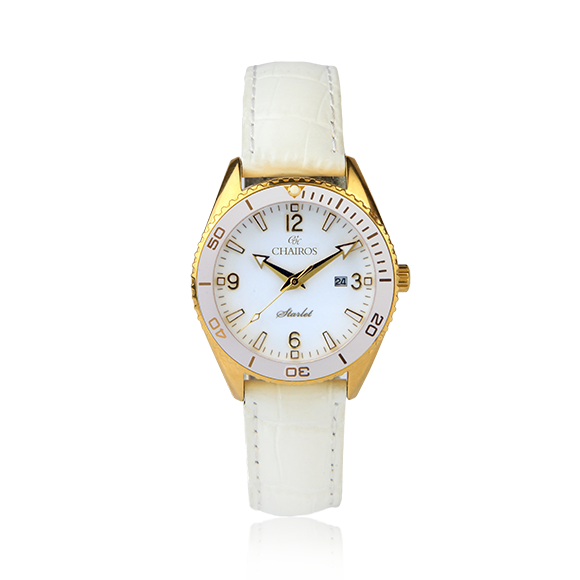 The CHAIROS® Starlet is adorned with a durable white genuine leather strap. Undoubtedly, the watch gives a polished and uber cool look! The durable and scratch proof sapphire crystal glass gives it a water resistant cover up to 50 metres. The Starlet comes with an additional set of genuine leather straps. Wear your choice whenever required. The Chairos® Trendz Enerjii Watch with Far-Infrared, Negative Ion and Magnetic technologies helps you deal with the challenges of modern day living. The Far Infrared elements absorb energy from various sources and release it for gentle warming to help support circulation. They emit a Far Infrared output that is identical to the specific wavelength produced by the sun. A modern piece with powerful style combined with wellness benefits, the Chairos® Enerjii bracelet brings you the most advanced wellness technologies; negative ion-infused silicone, neodymium magnets and far infrared inserts. 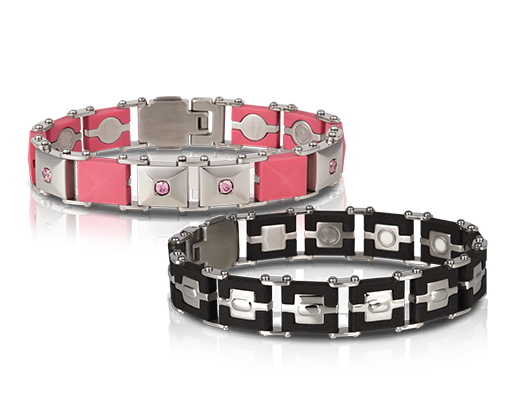 Innovative and bold design makes Enerjii bracelet the must-have accessory. No matter if you are playing sport, going to the gym or even going out for a night on the town, Chairos® Enerjii Lady will make you the centre of attention. Simple yet fashionable to wear anywhere, the bracelet gives you an extra edge of confidence and helps in overall well-being. A gentleman can feel confident at any occasion wearing Chairos® Enerjii Gent. Specially created to suit your style, the black and polished stainless steel design is a perfect band for a man who strives to live life to the fullest and look great doing it. 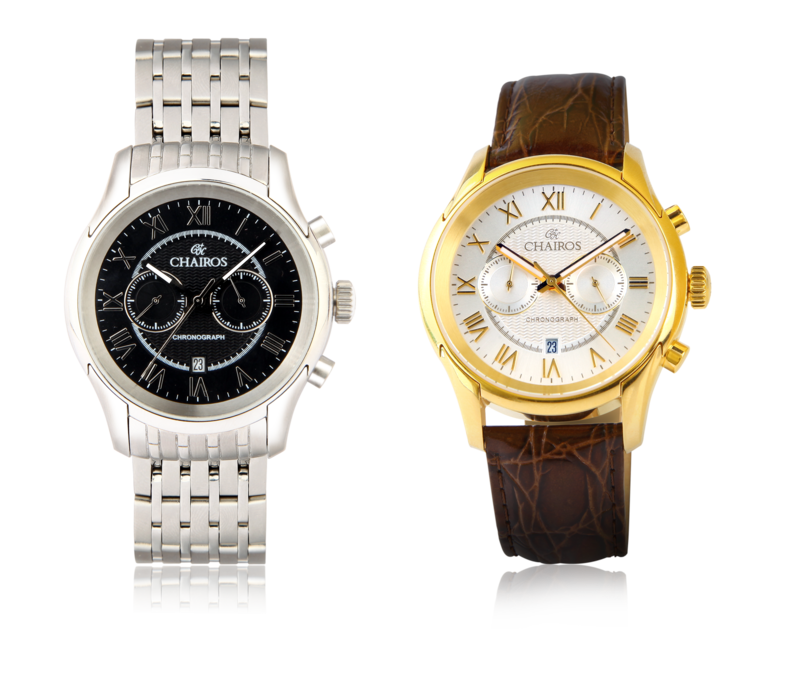 Timepiece for men… rediscover the magic in you! A brilliant chronograph watch with an incredible design pattern that features a black dial decorated with an applied index in Roman characters. Wizard’s sturdy construction includes a stainless steel case with stainless steel bracelet. The durable and scratch proof sapphire crystal glass gives it a water-resistant cover up to 50 meters. Also avilable in Gold Plating (GP), with an immaculate leather strap. The revolutionary Alpine Neo SS by Chairos® marks the dawn of a new age of watches. Chairos® Alpine Neo SS boasts a stylish and subtle design crafted exclusively to celebrate the versatility one personifies. Inspired by the grandiose beauty of the Swiss Alps, the CHAIROS® Alpine Neo SS chronograph watch is built for the adventure-driven soul. It dons a dual-tone steel and rose gold-plated stainless-steel bracelet. The signature scratch-proof sapphire crystal provides water resistance of up to 150 feet, protecting the watch’s Swiss-made movement. The CHAIROS Vector Silicone gives you the key to master time and live your classic moments. A smart and stylish watch for men, it is fitted with a flexible blue silicone strap for improved flexibility, and is waterproof, lightweight, and very comfortable to wear. 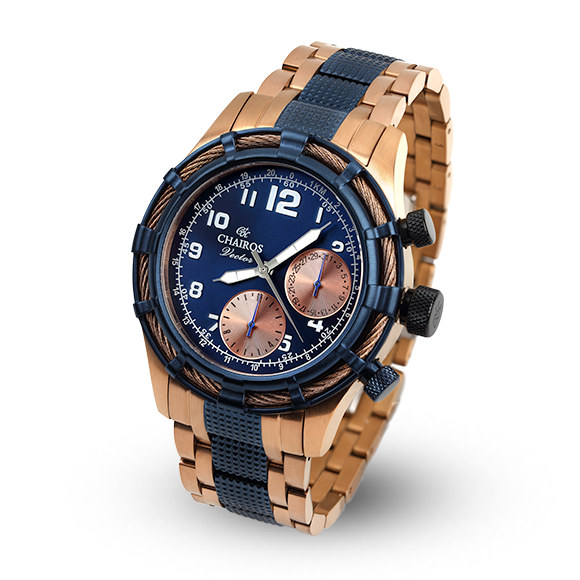 The blue rope bezel adds an extra touch of elegance to this timepiece. What’s more, with its added feature of a GMT second time zone, you can live in two time zones at once. 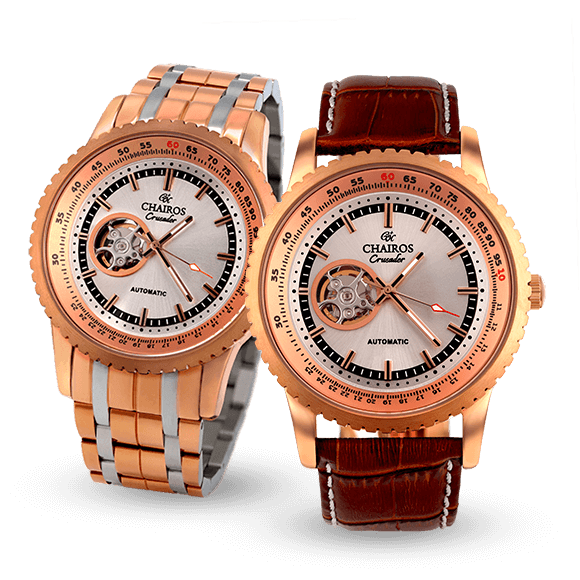 Designed with the motivated man and woman in mind, CHAIROS® Silver Mist Men’s and Women’s watch uplifts lustrous and efficient style to a whole new level. The silver steel case and blue-tone accents make the watch outstanding; while the date function and chronograph dials complete this dynamic piece. It is suitable for all manners of occasion, from business meetings to travel. This watch is powered by a Swiss-made movement with chronograph function. 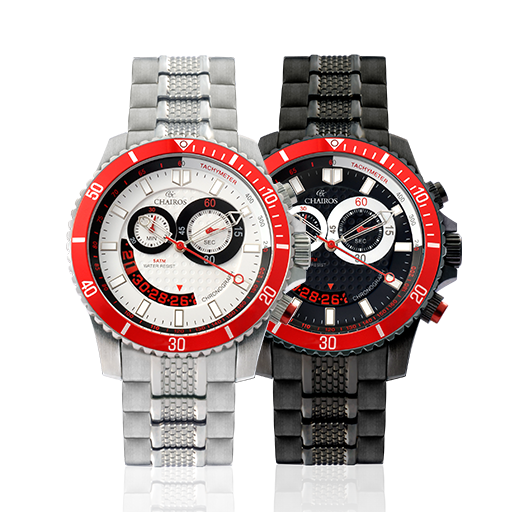 It provides a water resistance of up to 50 metres with the help of its durable and scratch-proof sapphire crystal glass. 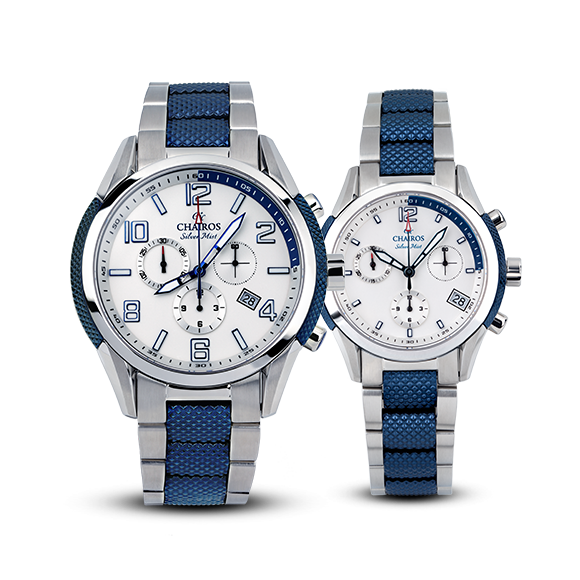 This classy timepiece comes with an attractive and durable stainless-steel dual-tone silver-and-blue-plated bracelet. The CHAIROS® Vector Silicone gives you the key to master time and live your classic moments. A smart, stylish and sporty watch for men, it is fitted with a flexible blue silicone strap for improved flexibility, and is waterproof, lightweight, and very comfortable to wear. 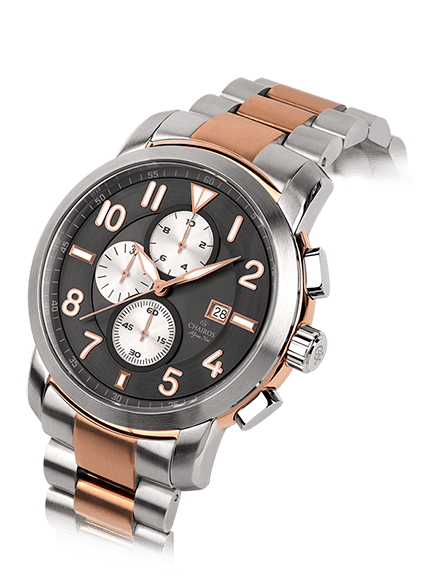 It also comes with a stainless-steel dual-tone bracelet, which makes this timepiece very distinct. The blue rope bezel adds an extra touch of elegance to this timepiece and the rose gold rope bezel offers this watch boundless quality. What’s more, with its added feature of a GMT second time zone, you can live in two time zones at once. It has a durable and scratch-proof sapphire crystal glass, which provides a water-resistant cover up to 50 metres.